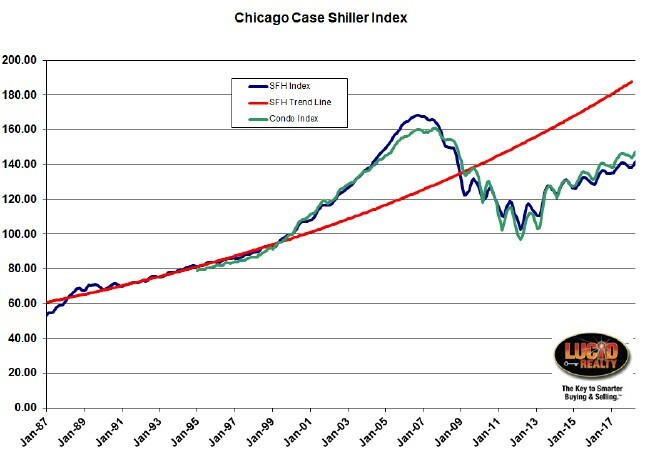 Dow Jones S&P CoreLogic released the April Case Shiller home price index a couple of weeks ago while I was otherwise occupied and it remains a sad story for the Chicago area. Although we did see our 66th consecutive month of year over year gains in single family home prices and the highest gain in 5 months, our 3.0% appreciation rate just wasn't strong enough to compete with the other 19 metro areas. Thus, we reported the lowest appreciation rate in the group, placing us behind even Washington DC with a 3.2% rate. The nation as a whole gained 6.4% in the last year, while the 20 city composite gained 6.6%. In addition, three cities out west came in with double digit home price appreciation rates. Meanwhile condos and townhomes gained only 3.4% in April, which was the smallest gain for that segment in a little more than 2 years. The graph below shows the historic annual appreciation rates for both property types. Chicago area home prices have shown annual gains for 65 consecutive months. The favorable economy and moderate mortgage rates both support recent gains in housing. One factor pushing prices up is the continued low supply of homes for sale. The months-supply is currently 4.3 months, up from levels below 4 months earlier in the year, but still low. Looking back to the peak of the boom in 2006, 10 of the 20 cities tracked by the indices are higher than their peaks; the other ten are below their high points. The National Index is also above its previous all-time high, the 20-city index slightly up versus its peak, and the 10-city is a bit below. However, if one adjusts the price movements for inflation since 2006, a very different picture emerges. Only three cities – Dallas, Denver and Seattle – are ahead in real, or inflation-adjusted, terms. The National Index is 14% below its boom-time peak and Las Vegas, the city with the longest road to a new high, is 47% below its peak when inflation is factored in. The only thing is that Chicago's home inventory is as tight as anywhere else in the country, yet we are not seeing the price appreciation that others are. The April Case Shiller Chicago index for single family homes was up by 1.2% over March, which is actually the highest one month increase in almost 2 years, and the condo index was up by 1.3%, which is the biggest increase in 12 months. However, you can't get too excited about the one month numbers because there is a lot of noise and seasonality in them. For a longer term perspective on the underlying index values check out the graph below. You can clearly see the progress we've made from the bottom of the market in March 2012. 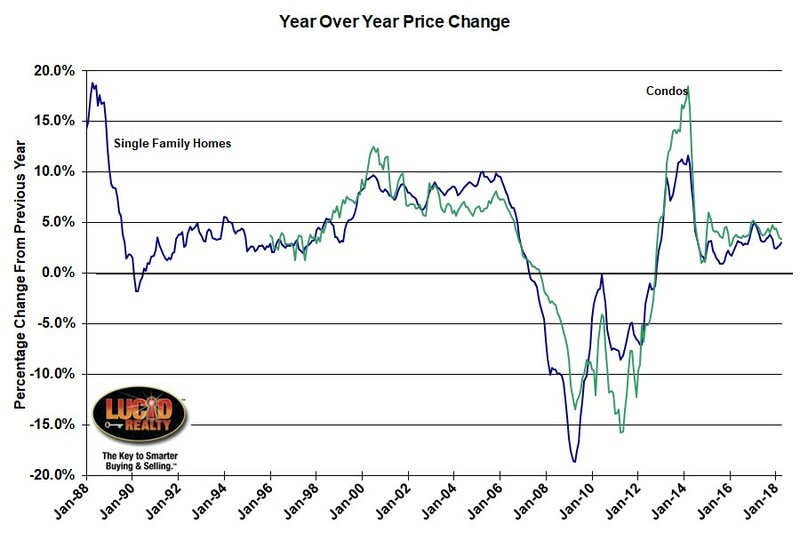 Since then single family home prices have risen 38.0% while condos and townhomes are up a whopping 51.9%. However, we still have quite a way to go to catch up with the peak values of September 2006 since single family home prices are 15.9% below that level and condos and townhomes are 8.2% below it. Putting the current level in further, depressing historic perspective single family home prices are still below where they were during the entire period from May 2004 - November 2008 and condos/ townhomes are still below their level from May 2005 - November 2008. Furthermore, single family home prices are lagging the pre-bubble red trendline in the graph below by 25.0%.